Lots of opportunities available today to make extra money online doing surveys and participating in online activities. 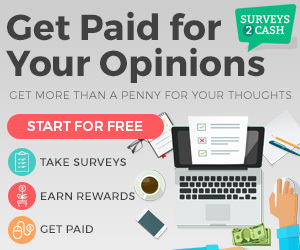 Hurry and sign up for Surveys2Cash before spots fill up. With membership filling up fast, an opportunity today could be gone tomorrow. They pay via PayPal or you can choose a gift card.